Too many clothes, nothing to wear? Feeling overwhelmed by the sheer volume of clothes in your wardrobe? 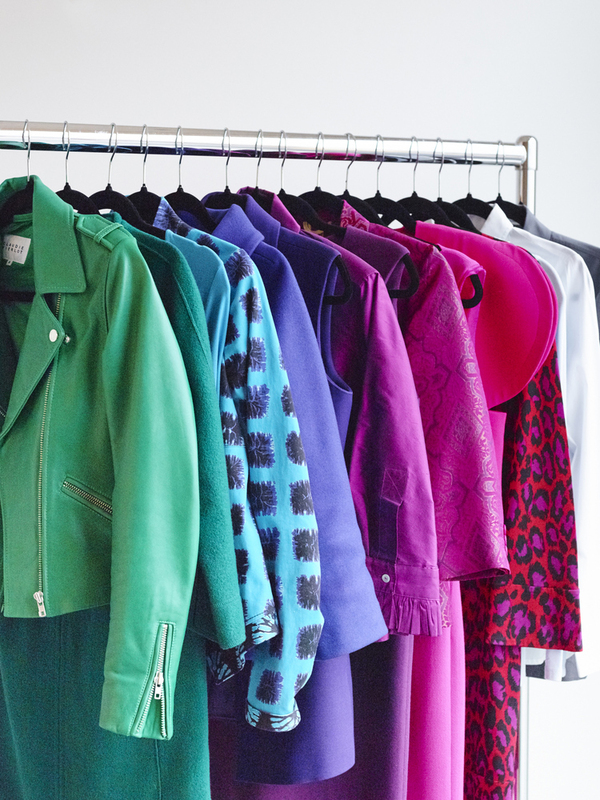 We've put together our top tips for decluttering your wardrobe and shop smarter. If you have had your colour and style analysed by Red Leopard, then you will know exactly what colours suit you and know how to build a perfectly co-ordinated wardrobe which is in harmony with your body shape and personality. If you haven't had a consultation with us just yet, then we're sure you know which colours you prefer on yourself, and feel most comfortable in, so we'll work with that. The first step to achieving the perfect wardrobe is to put everything that is in your colour on one side. Once you have done this, examine what's left: is it worn out, too small, too big or simply outdated? We suggest to organise your clothes in colours when doing this. Build on your neutrals for summers, navy's, grey's and black's for the winters; and for the springs and autumns, focus on brown's, tan's, donkey grey and petrol blue. Look at adding in some of your star rated colours for inspiration, and then make a list of items you need in order to create workable outfits. A personal favourite of ours is scarves. These are an excellent way of pulling colour themes together whilst making bold statements in subtle ways. Have a peek at the Ivana Nohel X Red Leopard collection which have been designed to work perfectly with your season. When it comes to shopping smarter, budgeting is absolutely key. If you do not have a budget, you will either spend too much or too little. Having a budget will help you to maintain focus as well as giving you freedom and certainty. Remember that your wardrobe should reflect you and your lifestyle. So start with creating a list, then prioritise. We recommend that you create a budget to cover your clothes, accessories and grooming. It is important to create new combinations from your existing clothes, decide what to give away and identify key pieces to purchase before you hit the shops. Our wardrobe detox is designed to support you through this process. Now you have a budget in place, it is time to hit the shops. Next you should decide where you are going to shop – consider location and budget. Then ask yourself, do you prefer department or high street stores? Do you enjoy shopping in speciality stores? This will only be successful if you enjoy it; the phrase time flies when you’re having fun' comes to mind. One thing to note is to wear clothing that is easy to slip on and off in the fitting rooms. Comfortable shoes are also key – nothing ruins a shopping day more than achy and painful feet. It's the ultimate shopping buzz kill. Once you reach your store of choice, the first thing you should do is to scan the store. Here at Red Leopard we like to call this 'the blanket shop'. You should look for everything that is in your colour, then assess if it is the right shape for you. If so, check if it is the right style, and if it passes this test then take it to the fitting room and try it on. Then compare and discard items that do not work. The Red Leopard team suggest that shopping every 2-3 months is a good amount in order to avoid being desperate for a certain item for a specific occasion. If you need a helping hand, book a Wardrobe Review with Red Leopard and have one of our experts work through your wardrobe and help transform it to perfection.